When you and your dog are up for it, you can move into competitive obedience. There are five levels to competitive obedience, plus the basic Elementary. Elementary – this is for beginners, and starts with basic on-lead heelwork and a one-minute sit and down stay (facing your dog). When you’ve won one Elementary, you’ll move up to Special Beginners. Special Beginners – includes on- and off-lead heelwork with left, right and about turns. You’ll also do a recall from sit or down, a one-minute Sit stay and a two-minute Down stay (facing your dog). To progress to Novice, you need to win two Special Beginners. Novice – You’ll do more turns in your heelwork, and start on recall. You’ll also begin retrieving, with a dumb-bell. There’s a one-minute Sit stay and a two-minute Down stay, this time facing away from the dog (but remaining in its sight). You don’t have to win Novice before moving up, but once you’ve achieved two wins you have to level up. Test A: You’ll do on- and off-lead heelwork, with the introduction of combined turns (for example, an about turn immediately followed by a right turn). You’ll carry on with the retrieve, but be more limited in the commands you may use. You’ll also begin scent discrimination, where your dog will have to find a cloth with your sent on it among 8-12 other sterile cloths. Test B: All your heelwork is off-lead and you can expect more combination turns, as well as both slow and fast pace. You’ll start sendaways, where your dog is sent from the heel position to a marker, dropped, and then recalled to heel. You’ll progress your stays, with a one-minute Stand (facing away from the dog), a two-minute Sit stay and a five-minute Down stay (both out of sight). Scent discrimination adds in two ‘decoy’ or hot cloths, to go with the sterile cloths and the one with your scent on it. Test C: This one’s the pinnacle. Your heelwork is still off-lead, and now you’ll have to add in weaves and figure-8s. You’ll do advanced positions, where the judge will have you leave the dog in a Sit, Down or Stand position, you’ll continue forward, about turn and pick up the the dog in the heel position again. You’re only allowed commands for advanced positions and ‘heel’ from advanced positions. Distance control also becomes an exercise in Test C.
Obedience is scored out of a possible 300 points, and once you’ve scored above 290, as well as at least one first and two seconds under different judges, your dog gains the title of Obedience Champion. 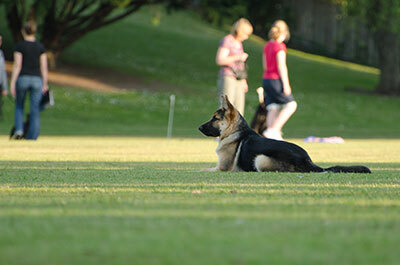 To become a Grand Obedience Champion – the dog obedience equivalent of a gold medallist! – you need 20 certificates with points over 290, with five certificates over 295, plus 10 wins. Ribbon Trials – ribbons are awarded for winners and place-getters at all levels. You don’t have to be an NZKC member to enter. Championship Tests – prizes are awarded and wins at any level affect both Ribbon Trial and Open Trial wins. You must be a member of NZKC to enter competition at Championship level.